A- Blue. It's a Merfolk using water magic on something. B- Blue or Blue/White. The long stream of Blue means they'd definitely make this a Blue card but the fact he seems to be boosting his own weapon and the meantioned above likeliness of being from Bant makes me think a WU dual card could work. C- Black as she's surrounding herself in the void. Though a colorless card also could work. D- Green. It's a wurm lunging at something flying, this looks like an underwhelming 1990's Green card that would like deal 5 damage to one Flyer for too much mana compared to Plummet. E- Blue because it's so goddamn blue. SOme sort of reading, probably would let you search top five cards for an Instant or Sorcery. F- Red or Black. Giant demon in field of flames, it's Red or Black. G- Green. This is obviously a fight card. I could see this being one of the enchantments. H- Hard to tell for sure but looks either Green or Green/Black. I- Red. It's flaming rain. J- Green. It's an Ixalan Merfolk which means Green or Blue and the framing of crouching, looking at tracks makes me think Green. Probably with Explore. K- I actually thought that was a construct before, but yes it is a DInosaur. Gonna be honest this art makes me think Ixalan reprint of Temple of Enlightenment for some reason. Just really strikes me as a WU dual land. Most likely to be used as White as it's the most color neutral. L- U or UB, most likely some sort of control card and not a creature itself. Could work as an enchantment, probably that grants a Saboteur ability. A) Alright, I thought it was just a weird like Shadowmoor Merfolk or something but that's two people I've seen saying Salamander so seems right. Still likely monoblue. H) I meant color but yeah I also couldn't really tell what it was in the art, thanks. That's something they used to do, but stepped back from. I know as late as Mercadian Masques, the colour palette was supposed to match the card color. Afterwards they figured out that players were able to tell a card's color anyway, and that it made the art bland. It's never been perfect: Odyssey Anarchist, for instance. Betrothed of Fire has a pretty similar palette to E; there's red at the bottom but it's dominated by a dark blue scene. A lot of night shots do that. 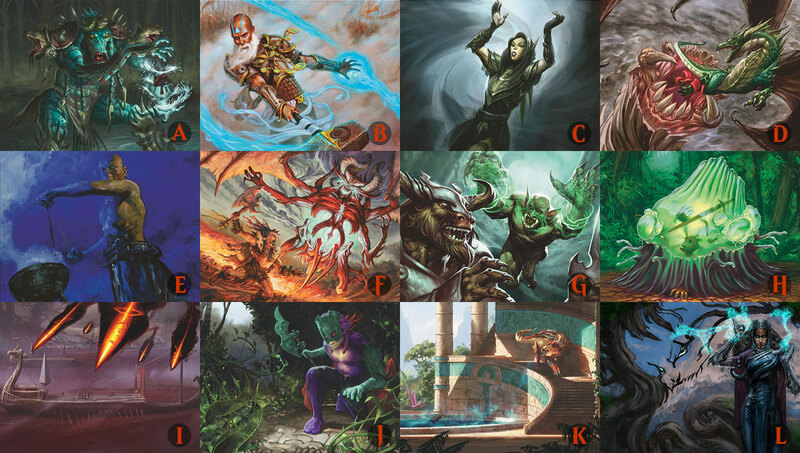 As another contrast, Dark Ritual is really heavily red in its 5e art (also the most modern) and its Ice Age art could easily be deemed red/green based on the palette. A) Blue or blue/black. The motifs are swirling water, sea-life, and snakes. D) Green, It's a flying hate spell. H) Green or Green/black, it's an ooze digesting somebody. Instinct is green. I) Red. Is this a cancelled Flame Javelin invocation? J) Green, Blue, or Blue-Green -- it's an ixalan Merfolk. K) With no other guides, I would suggest the pallet is actually good here, and agree with the blue-white, possibly blue-white producing land. L) This one is interesting. Like Sylvan Echoes it has a negative image, and that image is a demonic face, which suyggests black, while the magical glow being teal is an indicator for blue. The outfit of the caster seems more black. I'm going with blue-black.